research in other areas, such as the phenomenon of flow and semantic object representation in the brain. 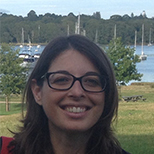 Elisa joined LSBU in 2017. She completed her PhD in Psychology in 2012 at Goldsmiths, under the supervision of Professor Joydeep Bhattacharya. Between 2012 and 2015, she carried out post-doctoral research at Goldsmiths, Caltech, and the University of Cambridge. More recently, Elisa was a postdoctoral teaching associate at Royal Holloway, University of London. Elisa's research has spanned different areas of cognitive neuroscience. Her research interests mainly focus on three areas: the psychology of music, language syntax and semantics, and the nature of shared processes between music and language. Other researched areas include the study of flow and its expressions in the brain, the formation of semantic knowledge in visual object recognition, and time perception. Methods used encompass a range of behavioural and EEG/MEG analyses.